The opener does a small share of the work necessary for opening and closing your overhead door. The bigger share belongs to the garage door springs. These components are usually used for operating lighter residential doors, as the nature of their operation makes them more susceptible to wear and tear damages. Extension springs are made from steel. Usually, the steel is galvanized so that they can be more resistant to rust. They come and operate in pairs, with one spring installed on each side of the door. These components then stretched and become loaded with tension. It is common for each spring to be held in place by a bolt which is attached to the same angle iron holding the horizontal track in place. There is a fork component connecting the spring to a pulley. A lift cable goes over the pulley, while its bottom end is attached to the door. When the door opens, the extension springs contract and release the force which they hold. This force is used for lifting the door upwards. It is passed to the pulleys and then to the lift cables, that ensure that the door moves properly. When the door is closing, the springs stretch and get loaded with tension once again. In this way, they can keep the door straight and stable while it is in its closed position. 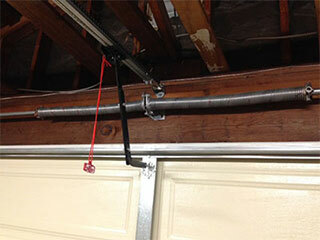 One important feature that goes hand in hand with garage door extension springs is a set of safety cables. One safety cable runs through the axis of each one of them throughout their entire length. If a spring breaks, the cable works to hold the door in place and keeps it from collapsing. This is only a safety measure and should not be relied upon for the proper operation of your door. A broken extension spring can be extremely dangerous, as it could cause severe lacerations and injuries. Contact our experts at Garage Door Repair Encino to get your extension springs replaced safely by professional technicians.